CLEMSON, SC – In its final home tuneup before next month’s ACC Indoor Championships, the Clemson track & field program welcomes over 20 schools to town this weekend as it hosts the Bob Pollock Classic. Among the schools scheduled to compete are ACC foes NC State and Pittsburgh and in-state Division I teams Anderson, Coastal Carolina, Charleston Southern and SC State. In all, over 700 athletes are making their way to Clemson to compete Friday and Saturday. The meet is split into two days, with unseeded running events set for Friday and the top sections reserved for Saturday. Field events are the exception. All field events are seeded the same way, but are not divided into two days like the running events. Friday’s schedule also includes the heptathlon, which starts at 9:30 a.m. with the 60 dash, and the pentathlon, set for a 10:30 start in the 60 hurdles. 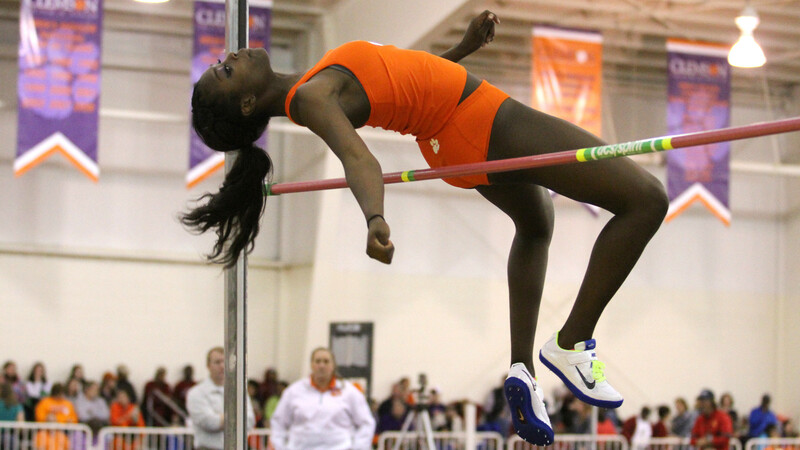 The majority of Clemson’s track athletes are slated to compete Saturday. The Clemson men’s team has gotten off to a strong start this indoor season. The Tigers have a number of athletes ranked among the top five in the ACC in their respective events, led by Tevin Hester and Reggie Lewis in the 60 dash. The duo ranks second and third on the ACC performance list behind Florida State’s Dentarius Locke. In the field, high jumper Torian Ware is second on the conference’s performance list. He owns a season-best clearance of 7’0.25″ on two occasions and is Clemson’s indoor record-holder (7’5″) in the event. Shai Carpenter also ranks among the league’s top five in the triple jump, a near 50-foot leap from the Orange & Purple Classic on Jan. 11. The women’s team is adjusting to new leaders among its 2014 team. The highest-ranked runner in terms of the ACC performance list is Brianna Blanton in the 800 meters, where she is fifth with a season-best 2:10.13, converted from her Orange & Purple performance three weeks ago. Whitney Fountain (60 dash) and Anasterasia Terrell (60 hurdles) also rank among the league’s top eight in individual track events. In the field, Mimi Land ranks among the ACC’s top six in three different jumping events. She is as high as fifth on the performance chart for the long jump. Lauren Terstappen, a graduate pole vaulter, is sixth on the ACC’s list with a 3.90 meter jump (12’9.5″) on Jan. 11.